It’s still a great time to purchase a home. Interest rates set by the Federal Reserve are still incredibly low and consumers are taking advantage of the benefits. We often have clients come to us when national mortgage rates are down and are ready to jump on that “3.5% 30 year fixed” they heard about on the news. For some, we can help them “get in while the getting’s good,” and secure a great rate for the life of their loan. For others, things can get a bit more complicated. Here’s the truth: Mortgage interest rates will not be the same for every borrower. The rate you’ll actually receive is dependent upon several factors, with your credit score being at the top of the list of importance. Borrowers with strong credit scores tend to receive lower interest rates. Why? Because if you have a higher score, it means you’ve managed your finances well over time, and are therefore perceived as less of a “risk” to lenders. If your credit report shows evidence of late or missed payments or if you are maxing out the credit you have already been granted, you may be deemed more risky by a lender, and your mortgage rate will increase to offset the possibility that you may default on the loan. 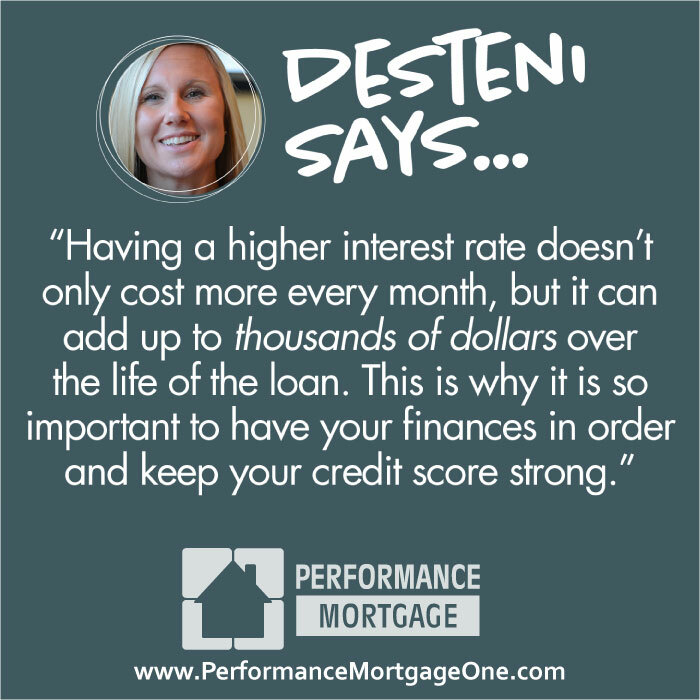 Having a higher interest rate doesn’t only cost more every month, but it can add up to a big number (thousands of dollars!) over the life of the loan. This is why it is so important to have your finances in order and keep your credit score strong. If you’re ready to purchase a home but your credit could use improving to get the best rates, we can help! Reach out to us today at (877) 892-8222. Our goal is to not only get you into the home of your dreams, but to find the BEST solution for you.